A few days ago I celebrated my 60th birthday in Malawi. There was no party, cake or ice cream and only a few people even knew. But it was okay because I had already received my gift. I am a Peace Corps Response Volunteer serving in Malawi for seven months as an Education Specialist. About five years ago, I redirected my life and retired early after teaching fifth-grade for twenty-two years. I was then inspired to join the Peace Corps. I was invited to serve in Uganda for two years in their primary literacy project. After I came home from Uganda, I knew I wasn’t quite finished. There was more I wanted to do. More I needed to do. So, I began searching the Response openings posted on the Peace Corps website for the right fit. I found it in Malawi. I’ve switched my focus from educating primary school students to empowering and educating adolescent girls in secondary school. I do this through a partnership between Peace Corps Malawi and USAID’s Apatseni Mwayi Atsikana Aphunzire (AMAA) project. 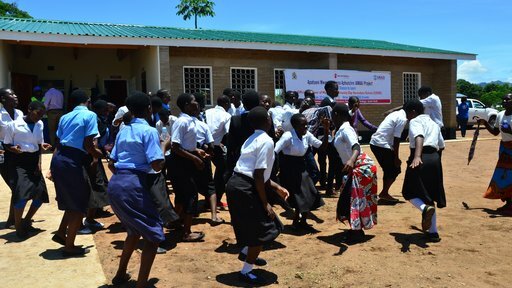 That, in the local language of Chichewa, means ‘Give Girls a Chance to Learn.’ An initiative led by Save the Children, the goals of the project are, simply put, to get girls in school, to keep them in school, and to ensure their progress in school, in addition to being healthy and supported by the community at all times. Of the eleven brand new secondary schools being constructed in Malawi for the AMAA project, five have been completed and are officially open. Each school has one Peace Corps Response Volunteer on the campus, and that’s why I’m here! I am placed way off the grid in Machinga District in a rural village. From Monday to Friday, 7 a.m. to 3 p.m., you’ll find me in one of three places: teaching Form 1/freshman English and literature to a class of 75, co-administrating with my Head Teacher, or serving as a liaison for our local and international nongovernmental organizations in the AMAA project. Together we plan empowerment activities and teach life skills to keep girls in school and reduce teen pregnancy and early marriage, improve gender equality and provide HIV/AIDS education. 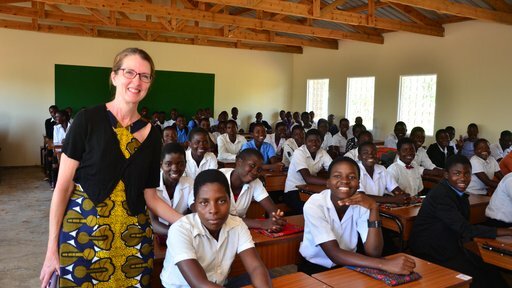 I have brought all the professional skills I learned and used as a teacher in the U.S. and as a volunteer in Uganda, combined with my personal beliefs as a mother, grandmother, sister and daughter, to these students, especially the girls. My heart will always be in the classroom with these students. I believe that literacy is the tool for development. If we can teach our girls to read, understand, comprehend, and think critically, plus connect it to their own lives, we have given them the skills to make choices, to be creative, to be self-advocates, and most importantly, to have a voice. I wish you could have heard the voice of one girl at my school. During the official opening of our school campus, I watched one strong, intelligent, confident student of mine, named Shakira, deliver a speech, on which we worked together, to an audience of hundreds. On behalf of all of the students, she thanked USAID for their new school. She stood alone at the microphone and spoke with purpose, poise, and passion. Here is an excerpt from her speech. “All students here, but especially the girls, are very thankful. This new school has reduced the distance girls were traveling. Many would walk 10-15km to a nearby secondary school, but now that distance has been shortened. Before we faced many problems, such as being punished for late coming, hunger, and tiredness. This made us perform poorly and fall behind in our education. But now, we are here, and we are grateful. We love to learn! We want to learn! Let girls learn! During the applause following Shakira’s speech, a Malawian gentleman seated next to me leaned over and quietly shared with me he was moved to tears by her words and message. I could see the emotion in his eyes. Me too, I thought, me too. That singular moment was the best birthday gift I could have received. To witness firsthand the voice of one girl share a powerful message knowing it moved people because she was heard. Sandra is a serving as an Education Specialist under Peace Corps Response. With 22 years of experience as an educator in America, she is now helping to get a newly built school in Malawi off to a great start by working with school administration and teachers as well as by teaching her own classes.